Over the course of his 53 years of ministry as a priest of the Archdiocese of Indianapolis, Msgr. Joseph Riedman baptized thousands of babies. At least one of them now wants to follow his example. He is seminarian Benjamin Syberg, a member of Our Lady of the Greenwood Parish in Greenwood, where Msgr. Riedman served as pastor from 1980-93. Syberg was only a toddler when Msgr. Riedman left his Indianapolis South Deanery faith community to become the pastor of Holy Spirit Parish in Indianapolis, but he looks up to him as a role model of priestly life and ministry. The formation of future priests like Syberg and the care of retired priests like Msgr. Riedman are supported through contributions made to the “Christ Our Hope: Compassion in Community” annual appeal made by Catholics across central and southern Indiana. Msgr. 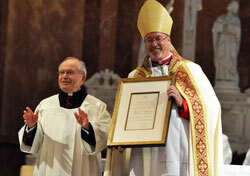 Riedman was 80 when he retired in 2009, 10 years beyond the age when priests can ordinarily request to retire. And although he no longer has a ministry assignment at a parish, he still offers sacramental assistance at parishes across the archdiocese on most weekends. He is also excited by young priests and seminarians like Syberg, who want to carry on the ministry that he has dedicated himself to since his ordination in 1956. For his part, Syberg hopes that he and his brother seminarians can eventually carry forward the torch that Msgr. Riedman and other retired priests have run with for so long. Msgr. Riedman can live on his own and be flexible to give sacramental assistance during his retirement in large part because of the health insurance and pension that he receives from the archdiocese—benefits supported through Christ Our Hope. Syberg is also grateful for the support that he receives through Christ Our Hope, support that allows him to focus his time entirely on his priestly formation and discernment. Deacon candidate Tom Hill has been on task in the archdiocese’s deacon formation program for five years now. He and his 15 classmates hope to be ordained as the archdiocese’s second class of permanent deacons on June 23, 2012. The deacon formation program, which is supported by Christ Our Hope, involves monthly weekend courses taken by the deacon candidates in retreat facilities across the archdiocese that are also often attended by their wives. Hill appreciates the support that he and his fellow deacon candidates have received over the past five years, and says that he is looking forward to showing his gratitude in his ministry once he is ordained a permanent deacon.